As a student at Mount Hermon School in the late 1920s, Gifford Hoag Towle met Marjorie Ripley Blossom, a young woman at the Northfield School for Girls. When Giff went on to the Massachusetts Agricultural College (BS 1932) and Marjorie to a midwestern Bible College for a year (before being called home due to a family crisis), they remained connected and after Giff’s graduation in 1932, they married. By the time that Giff graduated from Hartford Seminary, he had left his Quaker upbringing to enter the Congregationalist ministry, and he and Marjorie filled three pulpits near Pelham, Mass. In 1939, however, they were called by the American Board of Commissioners for Foreign Missions to serve as missionaries in the American Marathi Mission in Maharashtra State, central India. Following two years of intensive study of the Marathi language in Ahmednagar, they settled in Vadala, a rural village on the semi-arid plains, where they worked for thirty-four years, counting furloughs. 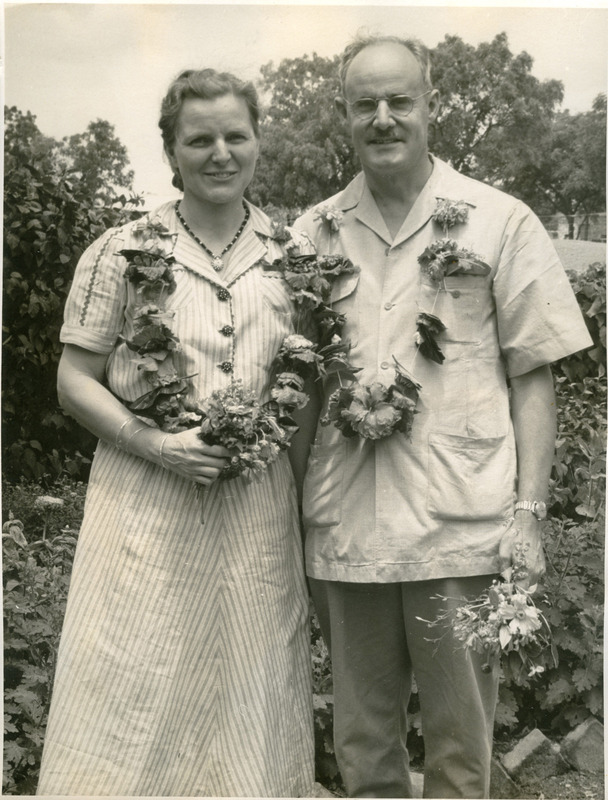 In 1946 on furlough in the U.S., Giff earned a master’s degree in agricultural engineering from Cornell while pastoring a small church in the suburbs of Ithaca. In his agricultural work in India, Giff used the mission farm to demonstrate crop diversity and farm animal improvement; created co-operatives to enable poor farmers to use appropriate modern tools and machinery for pennies; taught good irrigation and soil conservation; and later built a Mechanical Unit and trained local Indians as mechanics to repair machinery and drill wells. Giff also invented a pump for which he never filed a patent, wanting instead to make it as widely available as possible. He built networks with relatives, churches, and non-profits to fund these efforts and get supplies. The Towle Collection contains a wealth of information for research in three distinct areas: missions and religious matters; agriculture in “developing” countries; and the cultural and socio-economic context of social change in rural India. The Towles’ voluminous correspondence and reports offer a particularly rich view into mission life in India, including American participation through churches, relations between Hindus and Christians or between Christians, and the viability of these efforts. Marjorie’s letters are particularly vivid, adding significantly to our understanding of mission lives and experiences. The collection is equally rich in revealing the impact of the Towles’ agricultural work and for study of the efficacy of government agencies and non-profits seeking to understand cross-cultural issues. Founded by John W. Davis, H.H. Cook, A.J. Startzer and others in 1865, the Urbana Wine Company was among the earliest and most successful wineries in the Finger Lakes region of New York. 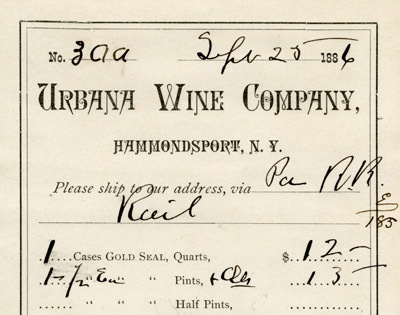 Organized in Hammondsport, N.Y., the center of the eastern wine industry, Urbana’s claim to fame was its widely popular Gold Seal Champagne and other sparkling wines and along with Walter Taylor, they dominated regional wine production during the Gilded Age. The winery survived passage of Prohibition in 1919 , both World Wars operating under the Gold Seal label, but was closed by its parent company, Seagrams, in 1984. The Urbana Records are concentrated in the period 1881-1885, as the company was growing rapidly. Among other materials, the collection includes a range of correspondence, receipts, some financial records, and tallies of grapes. Additional material on the company is located in Cornell University’s Eastern Wine and Grape Archive. Born in the Quabbin town of Enfield, Mass., Bob Wilder (1933-2015) rose from a life of poverty to a successful career in the Marine Corps and the aerospace industry. Becoming an avid local historian in his retirement, he drew upon his rural childhood while working later as an interpreter at Old Sturbridge Village and became a popular lecturer on topics in regional history. This small collection consists of materials relating to Wilder’s family and his research into the history of the Swift River Valley and the Quabbin Reservoir. In addition to some Wilder family photographs, the collection includes hand-drawn maps, newspaper clippings, town reports, magazine articles, oral histories, and poems about the towns of the Swift River Valley. Of particular note are several video recordings of Wilder’s lectures and an extensive series of oral histories with Wilder recorded by Marc Peloquin. Account book of Eunice P. Wyman of Concord, Massachusetts documenting financial transactions relating to her farm and homestead. She gained income not only from selling products (butter, soap, syrup for a sick man, pigs), but also through selling the services of her sons John and Franklin (picking apples, driving cows, digging potatoes, butchering, digging wells, shoveling gravel) and renting half her house to a man who paid, in part, by performing chores (putting rockers on an arm chair, white washing two rooms, making a flower box). Wyman’s goods and her sons’ services were typically paid for in cash or by exchange of goods or services (cider and vinegar, wool, by driving her cattle home from Stoddard’s pasture, shoemaking, plowing the garden, by “himself and oxen to go into town to get 23 rails and 11 posts,” use of wagons, horses, carts, and oxen). Customers have been identified as being from Concord, Carlisle, Acton, and Westford. The account book includes records of grocer Porter Kimball of Sterling, Massachusetts (1814), and recipes.